Who doesn’t love a great book release during the long days of summer? A chance to lose yourself in a tale of violence and retribution while the kids play in the pool is just what the doctor ordered! All Due Respect Books must have gotten word I needed some great summer reading materials, because they delivered a 2-for-1 special that’ll cure anyone’s summer boredom. 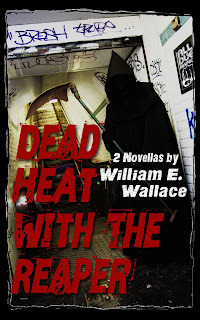 All Due Respect Books’ latest release is DeadHeat with the Reaper by William E. Wallace and it contains two novellas. I was immediately grabbed by the spectacular cover art supplied by Eric Beetner. I couldn’t wait to dig into the stories and I am pleased to say that I was not disappointed once I did. Frank Trask, preparing to celebrate his 67th birthday, collapses in front of his apartment complex and is rushed to the hospital. There he learns that he should get his affairs in order because he has cirrhosis of the liver and is too far-gone to have any hope of recovery. He returns to his home and is unsure of his next step. Frank, a simple living man, realizes that all the money he has put aside throughout his life has added up to more than 400K. Being that he has no spouse or children, he must come up with a way to use the money before he dies. Frank has become a gentle man in his old age, but Wallace allows us glimpses into Frank’s past where we see he is more than willing to resort to severe violence when the situation calls for it. Many years prior, two street thugs murdered his older sister and Frank extracted a brutal retribution on the two men. This flashback is a great indication of where Frank is willing to go when pushed and foreshadows events to come later in the story. Frank is a popular man in his neighborhood. He has the respect of his friends, the young men who live in the community, and his fellow tenants in his apartment building. One of those tenants is Natalie Hatfield, a young mother with a six-month-old baby and a jealous husband. Natalie has learned to keep her interactions with others to a minimum, as her husband’s jealousy manifests with swift beatings if he believes she is being unfaithful. When Natalie’s baby gets sick one night and she must turn to Frank for help, the wheels are set in motion in what will play out to be Frank’s final stand and the determine what type of legacy he will leave behind. Centered on the Claymore apartment buildings, this story shows the intersections of the lives of a young nurse, Susan Carnes, gang-leader Marcel, and an American war hero, Alan Baldocchi. Baldocchi carries many scars with him from his time on the Afghanistan battlefields. A roadside bomb killed his entire platoon, but he was left with thick scars that make his entire body appear to be made from wax. His psyche is fragile, as he blames himself for the death of his comrades. He finds solace in alcohol and solitude. 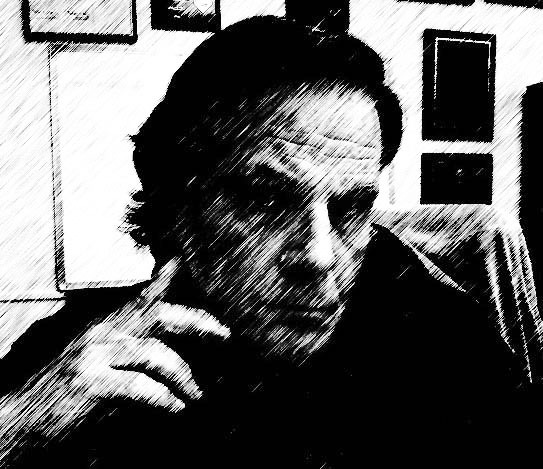 He desires no contact with the outside world, but when Marcel begins to target him and Susan with his actions, Baldocchi finds he must engage this battle head-on. The dénouement of this tale is dark, violent, and just what I love to read. This is one of the better novellas I have read in a long while. Stories like this are the type to put an author on my radar and, although I have read Wallace many times in the past, I feel he is at his best with this tale. Overall, I think this offering from ADR Books is a great addition to any noir lovers’ library. The two stories work nicely together as a collection, but are great stand-alone reads as well. I love new releases from All Due Respect Books and this book continues their tradition of outstanding noir. I have come to expect no less than the best from them and they continue to raise the bar for themselves with each new release.